There’s something about an omelet that says “It’s the weekend, dig in and get ready for a day that’s all your own!”. Whether you need a big meal because you plan on taking on the Tour De France or because you intend to laze about in your PJs watching movies with a full tummy, an omelet is the quintessential brunch food. Omelets are pleasing on so many levels. Aesthetically, of course, with some of the filling peeking out of the omelet’s fluffy, pillowy fold. And then there’s the texture. There’s nothing like, sinking your teeth into a chewy but tender omelet and, delighting in what’s inside— – juicy sauteed mushrooms, velvety spinach, sweet onions. — the world is yours. But what to expect from a tofu omelet? Not an exact replica of an egg omelet, but a delicious translation nonetheless. Chickpea flour gives the tofu a bit of fluffiness and a an eggy taste. Nutritional yeast adds color as well as a delectable savoriness. Turmeric goes the rest of the way for that, adding a sunshine- yellow hue. And then… black salt. If you haven’t tried it before, and you love the taste of eggs, you are in for a real treat. This Indian salt, also called kala namak, has a sulfuric taste that is reminiscent of egg yolks. I like to add some to the omelet batter, and also sprinkle it on at the end for an even stronger taste. If, however, you are adverse to the taste of eggs you may skip this and just use 3/4 teaspoon of regular sea salt in the omelet. This recipe is modified from Vegan Brunch. Tip: If using soft tofu instead of silken, some trial and error may be required because the water content varies so drastically from brand to brand. Some of my recipe testers added up to 1/2 cup water and it worked beautifully. But if you’re going to experiment, and you should, do it in half batches and try to have fun with it. (For example, don’t do it if you’re PMS-ing and apt to throw a blenderful of pureed tofu at the wall.) I find it’s best to start by adding 1/4 cup of water to the batter. Do a mini-omelet test by pouring 2 tablespoons into the pan. If the batter spreads out on its own and firms up when cooking then you are good to go. If it just sits there in a mound and doesn’t budge, then add another 1/4 cup of water to the batter. Chop up the garlic up in a food processor. Add the tofu, nutritional yeast, olive oil, turmeric and salt. Puree until smooth. Add the chickpea flour and cornstarch and puree again for about 10 seconds, until combined. Make sure to scrape down the sides so that everything is well incorporated. Preheat a large, heavy bottomed, non-stick skillet over medium-high heat. Well-seasoned cast iron works great, but if you’re not sure of the non-stickness of your cast iron, do a test (see tip above) or use a regular non-stick skillet. Lightly grease with either cooking spray or a very thin layer of oil. (The less oil the better for the nice brown speckles we’re going for.) Also, make sure that you use a large skillet, as you need room to spread out the omelet and to get your spatula under there to flip. Don’t use an 8- inch omelet pan or anything like that. Here you’ll need at least 12 inches (tee hee). In 1/2 cup measurements, pour omelet batter into skillet. Use the back of a spoon or a rubber spatula to spread the batter out into about 6- inch circles. (It’s okay if it isn’t a perfect circle.) Be gentle when spreading it out, if there are any rips or holes, that is fine, just gently fill them in as you spread the batter. Let cook for about 3 to 5 minutes before flipping. The top of the omelet should dry and become a dull matte yellow when ready to flip. If you begin to flip it and it seems like it might fall apart, give it a little more time. When the omelet is ready to be flipped, the underside should be flecked with light to dark brown when it is ready to flip. Flip omelet and cook for about a minute on the other side. Keep warm on a plate covered with tin foil as you make the remaining omelets. Stuff omelet with the fillings of your choice then fold over. Once the omelet has been filled, sprinkle with a little extra black salt, since some of its flavor disappears when cooked. It’s hard for me to imagine produce that wouldn’t find its calling stuffed into an omelet. When it comes to omelet fillings, think fresh and you can’t go wrong. Look deep within yourself that morning and find your spirit vegetable. And if that doesn’t do it for you, hit up your farmer’s market and go with what’s in season. Each of these fillings makes enough for 4 four omelets. Mix and match them to your heart’s content and come up with scrumptious fillings of your own. Preheat a large pan over medium heat. Sautée 4 cups sliced cremini mushrooms in 2 tablespoons olive oil. After about 5 minutes, when mushrooms are soft, add 2 cloves minced garlic and about 3 tablespoons fresh chopped thyme. Sautée about 3 minutes more, add fresh black pepper and a few dashes of salt to taste. Stuff into omelets and divide 2 cups of fresh, chopped spinach amongst them. The spinach will wilt in the omelet. Top with homemade cheezy sauce or shredded vegan cheese and fold. Marinate 1 pound asparagus, ends trimmed, in a mixture of 1/4 cup balsamic vinegar, 1/4 cup olive oil, 2 smashed cloves of garlic, fresh black pepper and a generous pinch of salt. Let sit for at least an hour or overnight. Grill asparagus on a preheated hot grill or grill pan for about 8 minutes, flipping once. Divide amongst omelets, top with tahini sauce and fold. Preheat an oven to 300° F. Slice 2 pounds of plum tomatoes lengthwise. Toss with 2 tablespoons olive oil. Sprinkle with salt and fresh black pepper. Place tomatoes face down on a rimmed baking sheet and roast for about an hour and a half. Stuff omelet with Cashew Rriccotta and about 10 leaves fresh basil for each, then add tomatoes and fold. Preheat a large pan over medium high heat. Saute 4 sliced sausages and 2 medium diced red peppers in 2 tablespoons olive oil. Stuff into omelets and, if you like, top with homemade cheezy sauce or shredded vegan cheese and fold. Use one bunch of chard. Remove stems and layer leaves on top of each other. Roll up into a bundle and thinly slice. Preheat a large pan over medium heat. Saute 3 minced cloves of garlic in 2 tablespoons olive oil for about 2 minutes. Add chard and saute until completely wilted, add splashes of water if necessary to get it to cook down. Salt to taste. Stuff into omelets and top with homemade cheezy sauce or sprinkle with shredded vegan cheese and fold. My aunt Bonnie invented burnt broccoli, probably by accident. It’s simple and even a little silly, but I absolutely love it. Preheat a large pan over medium. Sautée 4 cups of broccoli florettes in 2 tablespoons olive oil. Leave them alone for 2 minutes at a time so they can get a bit charred, then mix. Do this for about 15 minutes. Sprinkle on salt to taste. Stuff into omelets and sprinkle with shredded vegan cheese if you like, and fold. Use the bean recipe from butternut rancheros to stuff into omelets. Top with fresh salsa and guacamole. This is a favorite, and maybe the only one where vegan cheese is a requirement for me. Preheat a large pan over medium heat. Saute 3 cloves minced garlic in 2 tablespoons olive oil. Add 1 bunch of chopped broccoli rabe. Saute for about 7 minutes. Add 2 tablespoons capers and sauté just until heated through. Divide amongst omelets, top with shredded vegan cheese and serve. Stuff with guac and homefries or roasted potatoes. Serve salad on the side instead of potatoes. Preheat a large pan over medium heat. Sauté 1 1/2 cups of diced seitan, 1 small diced red onion and 1 diced green pepper in 2 tablespoons olive oil for about 10 minutes, or until browned. Drizzle in 1/2 teaspoon liquid smoke and cook for a minute more. Stuff filling into omelets, sprinkle on vegan cheese if you like, and fold. I did comment on facebook but have to say again -this was a big hit my house. I am making a batch tonight for my husbands and sons breakfast in the morning and hope it can keep for a day or two in the fridge. Yes! That is the magic of this recipe. I love these omelets gently reheated in a cast iron pan. What brand of silken tofu do you use? I only know the vacuum packed Mori-Nu brand. Can it be the firm silken or does it have to be soft silken? I’m so excited to make these. Thanks for sharing another fabulous recipe! People have had success with the Mori-Nu extra firm silken. I use Nasoya water packed though. i used mori-nu firm silken tofu, and just had to add some water. if your using this tofu just add a tablespoon of water at a time and test a bit of it on the pan to see if it spreads out a bit on its own, like the recipe says. it smelt a bit weird before cooking(i was comparing it to tofu scramble), but it tasted good. I followed the recipe exactly and it turned out great! I did use regular salt instead of black salt (as I didn’t have any) and it still had a bit of an eggy flavour about it. Next time I will definitely be trying these with the black salt (If I can find any!). It was worth ordering it. I’m not sure if they ship outside of Canada. My omni mother absolutely freaked out when she tasted how yummy these are! VB omelet is one of my all-time favorites. Awesome recipe. I made mini pancake size for english muffin breakfast sandwiches! hi isa! sounds so delish, but i’m so not talented at getting omelets to look beautiful. just wondered if you have tried (or think it would work) to make a mock baked eggs dish with this batter? i make a batch of these at the beginning of each week and freeze them. then pop one in the micro each morning. love them!!! what can I use instead of chickpea flour? I have brown rice flour, whole wheat pastry flour, corn flour, all purpose flour, splet, millet…. I thought it was utterly lovely, with vegan fauxage, mushroom and onion. A little tricky to get the exact thickness right (thinner is better) but marvelous and easy. However my vegetarian sister tried some and yelled “BLAK! Sheesh, how long has is been since you’ve had eggs, these are nothing like eggs.” I should also mention my sister is a bit of a nimrod at times and eats eggs every day. Though that is something of the trick to vegan cooking, don’t expect it to be EXACTLY like what it is mimicing at times, or you may be dissapointed, but look at it as an entirely new and delicious entity all of its own. This omelet sound wonderfull. Perfect for any time of day.Only one thing. I have tried the chickpea flour and it tends to taste bitter. Can we add a little agave nectar to the processer as we mix? Do you think this would throw off the recipe? Made as directed, except I accidentally added 2T of corn starch instead of one. Definitely more like a pancake than an omelette, and they split when I folded them–next time I’ll follow the directions and maybe shoot for a thinner batter. They were delicious anyway. I used the mushroom stuffing with chopped frozen greens instead of spinach. These omelets are totally amazing! I made them stuffed with mushrooms, garlic, and tomato and my four year old son devoured them. I never even liked omelets when I did eat eggs but something told me to try out this recipe. So glad I did! Just made these and they were delicious! All I had was Mori-Nu soft silken and it worked very well, just added about 1/4 cup water to the batter. By the 4th one, they were turning out perfectly! We ate them open faced with broccoli, green peps, and zucchini covered with Isa’s cheezy sauce. I will definitely make these again! Yummy! I didn’t have enough silken tofu anymore, so I added regular. Worked perfectly! Look at the calories, this gives you an imagination of the water content. The regular tofu I used had about double the calories per 100g (or take ounce as reference or whatever you got, just make sure it’s the same weight) than silken tofu. This means it’s got (roughly) half the amount of water. Higher cal in tofu = firmer = less water = more water to add. Pretty easy and works perfectly! I’m going to try it again using the leftover firm tofu and no silken, but I’m sure I can just use the same calculations. I make these so much, I don’t even have to look at the recipe anymore. I saute mushrooms, red pepper, and green onions for filling and I add some Daiya vegan cheese. Spectacular! omg absolutley sensational!! best omlette i have ever eaten and the fist time ive ever made a tofu based omelette.i used wholemeal self raising flour because thats all i had and it was lovely, fluffy and it held together extremley well. I developed some strange food allergies about two years ago and I had to give up egg dishes. I was ecstatic when I saw this recipe. Well, it did not fail me! I devoured every bite and if I hadn’t made it myself, I wouldn’t have known it wasn’t eggs. So, mine were really tofu-y tasty, which I find happens when I use silken tofu in anything. It’s rather unpleasant. Has anyone found a brand of silken tofu in Canada that is more neutral tasting? Other than that, this worked perfectly. The first one broke but the second one looked straight outta a magazine. We put thinly sliced sautee kale, red onion, tempeh bacon and daiya jalapeno havarti in ours. Is it just me? This was totally gross, mushy and tasted like camel farts….. It still fell apart 🙁 Is the chickpea flour necessary? I used regular flour, because I couldn’t find chickpea flour. So maybe that was it. It was still delicious though, but it was more of a scramble than an omelette! I’ve made this over and over again, and will continue to do so. Especially when my asparagus is coming up so delightfully!!! YUM! Oh, yeah, and the comment about the camel farts made me laugh….who in their right mind would ever admit to having eaten a camel fart??!!?? I agree with Carol–“mushy” was the predominate adjective I would use to describe these. My partner called these the worst thing I have ever cooked. We definitely didn’t expect them to be exactly like egg omelets, but, man, I’d (almost) rather eat eggs than these. I’ll try them again, tweaking the recipe–but following it exactly got two thumbs down and an alternate dinner cooked in my house. I made these this morning, and my toddler and I couldn’t get enough. SO good. A really delicious, savory pancake. YUMMY! For more of an omelette finish, prepare your filling(s) first and set aside. Then stir into finished batter before pouring onto the pan (or better yet, a griddle). what about using egg replacer instead of the flour? Thank you ! I love love love this recipe! I tried to make a vegan omelette a few years ago, and it turned out a gooey mess. I resigned myself to scrambled tofu and no omelettes from then on. Your recipe rocks, and the instructions are detailed enough that I had no more fear. Seriously, it’s an easy recipe and good enough that we had them 4 days in a row after I discovered it, with different fillings every time. Fresh spinach from the backyard is the best! I will only add that I did have mori-nu tofu, firm (the vacuum packed) and did add some water. When I tested it on the skillet, I could easily tell when it was the right consistency. I think it was slightly less than 1/4 cup. Just came across this recipe on facebook and tried it out on my meat eating husband. Didn’t have any cornstarch but used all the other ingredients and it was really tasty. Even got the thumbs up from my husband! 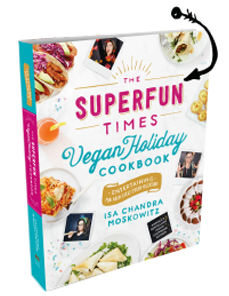 » VeganMoFo: Clueless Don’t Eat Off The Sidewalk! Such an inspiration! I cooked this morning because I had some silken lying around and the flavor was fantastic! I added a bit more oil (I also halved the recipe) to make it smooth and used a gf baking flour mixture. I may have needed to put more flour in there but it still came out so tasty and pretty. Thanks so much! I just made this from Vegan Brunch before reading this and realize now how important adding the water would have been. Mine didn’t spread and also the first two stuck to the pan because I didn’t let it get hot enough before pouring the batter. My stuffing was great though — tofurkey sausage stir fried with red onion, mushrooms and red pepper. Just made a batch of these and we devoured them. They were absolutely FABULOUS! I used water packed extra firm tofu because that’s what I had and I pressed it in my Tofu x-press first (out of habit) then I added about 1/2 cup of water to mixture as I blended it. I used Bob’s Redmill gluten-free baking flour which is a mixture of oat flour, chickpea flour and fava bean flour. They were easier to fold than I remember an egg omelette to be. I filled them with a sauteed mixture of diced red onion, garlic and mushrooms and a sprinkling of Daiya pepper jack. The flavor was spot-on and the texture was perfect. My husband who doesn’t love tofu scrambles ate 2 1/2 of these omelettes and would have eaten more if I hadn’t stopped him. The black salt, which I know is difficult to find, is essential. My head is spinning with all the filling possibilities. Thank you!!! These look gorgeous! I can’t eat yeast, it makes me mega-sick…which is so sad, I can no longer enjoy delicious craft brews *sniffle*. Can you suggest a substitute for nutritional yeast? Looking at the ingredients, I’m thinking these will be yummy without the powder too. <3 I love your non-fake fake cheese substitute—thank god I can eat cashews with impunity. I made these today for myself and my 14 yr old vegan daughter. We loved omelettes and it has been about a year since either of us had one. This was a huge surprise and so delicious! I didn’t even have all the ingredients you suggested and it was still delicious. I didn’t have black sea salt (cooudln’t find it anywhere around me) or the tumeric. We filled it with spinach, mushrooms and a drizzle of daiya cheese. She used to douse her omelettes in ketchup but didn’t want any for this because the flavors were so delicious on their own. We have two extras for a quick breakfast later in the week! Thank you! Tried this recipe tonight and with a learning curve it worked out pretty well. I’d first say, I did use the recommended silken tofu and adding the 1/2 c. of water was essential to forming a pourable batter. As well, I was hesitant to used the entire teaspoon of black salt right off the bat, which did have a very strong sulfur odor when immediately added, but it indeed lost a good deal of its “flavor/scent” during cooking. Letting the mixed batter sit for a good 10 minutes might help the chickpea flour fully absorb the liquid thus reducing any unnecessary grainy texture inside. While I love cast iron pans, yours MUST be well seasoned, but even so I’d recommend against it and use a non-stick sprayed with PAM (as much as I hate to use it). The batter is very sticky, a challenge to hold together and “non-stick” quality is absolutely essential so as to ensure the best success possible. On this note, the longer it cooks the more the center will firm up, so cooking at slightly less than medium heat for the full 5 minutes as opposed to a higher heat for 3 minutes is again my recommendation. Check the bottom for over-browning and adjust your heat accordingly, but try the proper heat which will enable a full 5 minutes cooking time. Make sure all edges are not stuck to the pan and gently flip with as wide a spatula as you can and leave for the remaining minute. This recipe looks awesome! Can’t wait to try it. Will the batter keep overnight? I adore these. One of my favorite recipes from *VB,* which is my favorite Isa cookbook. They do usually split and I have to use a t-fal nonstick pan, or I end up with scramble, but it doesn’t bother me at all to eat them that way. I live in the Deep South, so humidity affects these…sometimes more or less water is called for, depending on the day. My favorite filling is olive and onion with some lemon zest and juice sprinkled on and dill added to the batter. It mimics the feta cheese Greek omelet I used to be obsessed with when I was vegetarian. I also do barely sautéed peppers, onion, and garlic folded in the omelet and stuffed into Italian or French bed to mimic the egg heroes my Italian family used to wolf down with abandon. It has been some time since I have eaten a vegan egg omelette. I believe it was on Winterlicious last year. When I tried to do it at home, I always failed. Thanks to your article, I realized that the problem was the type of tofu I was using. This time, I will follow your advice closely and report whether I was succsuccessful or not. Wow.. , sounds amazing . Just tried this – not so hot for an omelette or scrambled egg. (I have difficulty flipping omelettes)….HOWEVER – This is the best frittata base! Mix it all up; stir in fried ‘shrooms, onions, spinach, daiya cheese – pour it into a pan and bake! Yum!! Thank You! Go to recipe for brunch food! » Clueless Lights! Camera! Vegan! , you have an RSS feed I can sign up for. We have been checking all over the net pertaining to material regarding vegan cooking. Oh my gosh. I’ve just been thinking about how I want greek food. This looks perfect. tofu is so so good. Pinning! making these now. only one question: how liquid does one want the batter to be? Looks pretty good. Have not yet tried tofu as an omelet. Will do soon. And report back. I love black salt, but sometimes it doesn’t get eggy enough and I don’t want to just keep adding more salt. So I’ve been adding asafoetida in addition to the black salt and it’s worked perfectly. 35 Vegan Recipes For A Delicious & Healthy Meat-Free Change! Please read America’s Test Kitchen reviews of ceramic pans. They do NOT pass the egg test nor the the fish test UNLESS you treat the surface first and cook on low heat. I don’t know why you say don’t use vacuum packed. I’ve had really good results with the vacuum packed type. Can you make the tofu “batter” ahead and store in the fridge for cooking later in the week? These are really crepes… silken tofu works better than soft tofu which tends to just break up into tiny shards. I add several spices to the mix, to jazz up the flavor. I loved the idea of wrapping around asparagus, we usually use kale or spinach. Another substitute for powdered chick peas ( flour) is rice flour which may be much easier to find in a grocery store. I followed the directions exactly, but this was a total disaster. I made for a special breakfast with guest from out of town and I was emarassed actually. Didn’t taste great, omelettes did not fold, they broke, and they were crispy on the outside and runny in the middle, even though I cooked forever on low heat. Never making again. I followed the recipe but failed big time, don’t understand how everyone else succeeded. I only got like 2 omelettes of the recipe too. These turned out great. I stuffed half of them with roasted asparagus and smoked “gouda” and half with sautéed shiitakes and onion. Mine were quite a bit thicker than the ones in the photo, even though I used a half-cup of batter for each 6″ omelet. Smoked salt made for a nice finishing touch, too. We’ll make them again. Can you make the tofu batter ahead and store in the fridge for cooking later in the week?